Chicken Almonds is a famous Pakistani – Chinese dish. People refer to it as “Chicken Aallmonds” by pronouncing “L” in Almonds. Try this, it is one of my favorite dishes …..
-Heat oil and fry garlic. Add chicken cubes and stir fry until they are golden brown. Now add the vegetables except spring onion stems and stir fry for 2 minutes. Add the chicken stock. -Let it boil for 5 minutes. Now add corn flour water and mix well. Keep cooking for 5 minutes on high flame and add spring onion stems. -Add half of the blanched almonds and dish it out. 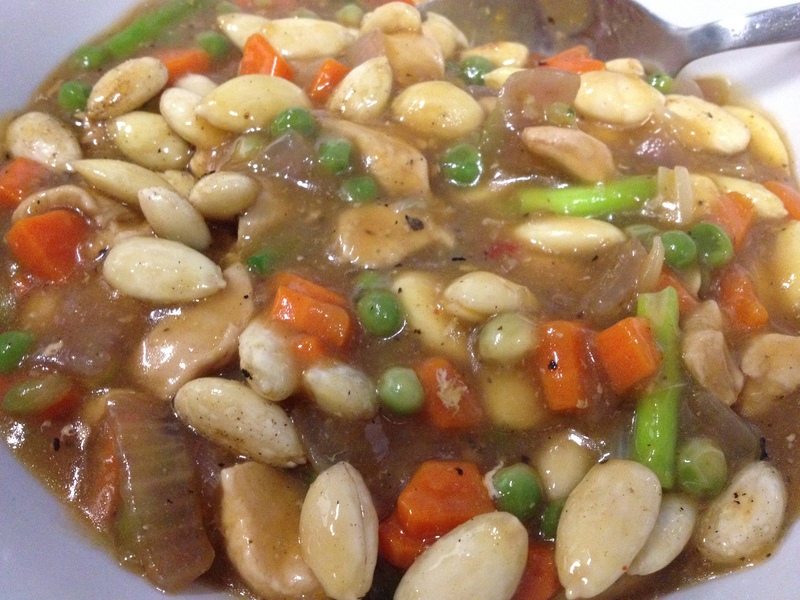 -Garnish the gravy with rest of the almonds and serve hot with boiled rice.